Darwin developed the theory of sexual selection to explain why the animal world abounds in stunning beauty, from the brilliant colors of butterflies and fishes to the songs of birds and frogs. He argued that animals have "a taste for the beautiful" that drives their potential mates to evolve features that make them more sexually attractive and reproductively successful. But if Darwin explained why sexual beauty evolved in animals, he struggled to understand how. 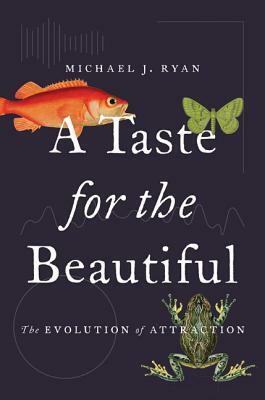 In A Taste for the Beautiful, Michael Ryan, one of the world's leading authorities on animal behavior, tells the remarkable story of how he and other scientists have taken up where Darwin left off and transformed our understanding of sexual selection, shedding new light on human behavior in the process. Drawing on cutting-edge work in neuroscience and evolutionary biology, as well as his own important studies of the tiny T ngara frog deep in the jungles of Panama, Ryan explores the key questions: Why do animals perceive certain traits as beautiful and others not? Do animals have an inherent sexual aesthetic and, if so, where is it rooted? Ryan argues that the answers to these questions lie in the brain--particularly of females, who act as biological puppeteers, spurring the development of beautiful traits in males. This theory of how sexual beauty evolves explains its astonishing diversity and provides new insights about the degree to which our own perception of beauty resembles that of other animals. Vividly written and filled with fascinating stories, A Taste for the Beautiful will change how you think about beauty and attraction.